How to Be Prepared for this NCLEX-RN Exam Well ahead of your test date? Often many students, who are preparing for their exam, don't really express interest in preparing for it ahead of time (common mistakes of many students), until the last possible date, thinking that if they finished their nursing degree program or went through good chunk of their nursing degree program passing NCLEX-RN will be no problem. That is a very common misconceptions, many students fail precisely due to the reason of not being prepared enough before their NCLEX registered nurse exam. Rome Wells recommends preparing for this exam well ahead of time, not the last minute, but as far back as the middle or even beginning of your associate or bachelor’s degree program. Typically in the beginning of associates and bachelor’s degree, students get a bit more worried about finishing their classes, getting their prerequisite courses out of the way and making sure they do well on their nursing degree courses before even bothering to look into any additional test preparation programs. However, often many schools, either do not comprehensively prepare students or students simply not ready for this exam due to being either stressed out too much working on other classes, or focusing too much on things that they shouldn’t be focusing as much. Studying well ahead of your NLCEX-RN exam can help you feel less stressed when the time comes. NCLEX-RN exam is fully focused around client needs framework, knowing what to expect on your test well ahead of time makes total sense, even if exam changes every 3 years, the frame works mostly stay the same, the way the concepts existed 10 years ago for providing better patient care the way they are now, of course with some minor additions. The point I am trying to make here is, having that framework skeleton knowledge in your brain, can help you not only to better comprehend courses in your nursing degree program and have better grades. Note there is counter argument to that. Some students may say, well what on earth kind of advice is that to tell students to understand client needs framework even before they barely got their feet wet in the nursing degree program? Yes that is a valid argument, however Rome Wells is an educational advocate and has years of experience tutoring other students and helping them get into better schools, get better grades and pass their doctor exams, military exams, placement tests, business exams, accounting exam and many others. Advice being provided here is for your own good, this way you feel less stressed and more prepared when the time comes and you need to take your NCLEX exam, being well prepared ahead of time even if you are barely familiar with your nursing degree courses, is highly beneficial. Reason for that is simple. Have you ever tried reading a book and realized that when you read it, you simply don’t understand what the book is saying, especially if you are reading it for the first time? Then after you re-read the book, it makes more sense? This is no different, except think of preparing for NCLEX RN exam can help you kill multiple birds with one stone, it’s like reading a book and being initially confused and not sure what it’s saying, but then gradually after going through your nursing degree program, realizing that what you saw initially in the book is beginning to make more sense? This is how essentially you reinforce your skills, and exponentially increase your chances of doing better on your NCLEX-RN exam by being exposed to client needs framework well ahead of time, this way when you see concepts presented in your courses throughout your nursing degree program, you will be hit with realization of what is the priority for you to know and what is not, and whether something that is being explained in your college degree nursing course makes sense to pay attention to in context of being better prepare for NCLEX-RN or not. This helps you brain to distinguish priorities between what makes sense to pay attention the most and what is not so important to pay attention to. Obviously Rome Wells is not saying that you must not pay attention to anything in your nursing degree program, unless it’s highly related to NCLEX-RN, what Rome Wells is saying is that being exposed to client framework even before you hit your major nursing courses, and then seeing these courses in action, can help you better reinforce your content knowledge expertise, and maximize your learning effectiveness and end up having better chances of passing your NCLEX-RN exam. So how can I be more exposed to NCLEX RN exam ahead of time, while I am still in my associate or bachelor’s degree program? One way is to try some sample questions, conveniently offered to nurses from GraduateX, and try them out see how they feel, even if you don’t know them. Then to further reinforce your NCLEX-RN test prep skills you can enroll into full version of the actual NCLEX-RN test prep course. 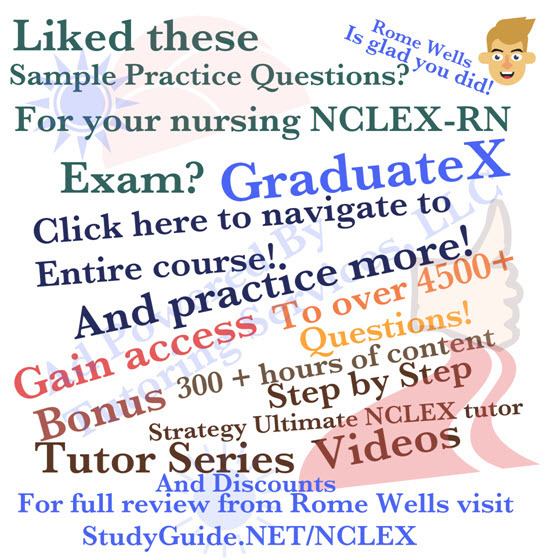 Rome Wells provides useful links to FREE sample questions, for NCLEX-RN exam and provides also brief analysis and review about GraduateX NCLEX-RN self-guided courses. Wait what if student is at the end of the nursing degree program and is not in the midst of or beginning of their program? What are their chances of passing NCLEX-RN exam? This question is difficult to answer, because it depends on student’s educational background, what courses they took, how demanding was their nursing degree program, and what grades you received in your courses, how well does student know your client needs framework. How much of their courses delegated attention to test prep, what practice materials they have already studied with, what books the read etc. It’s a tough question, this is why it makes sense for such students to simply try some free sample questions and see how well they do, just to get an idea of their overall content knowledge. What should students consider doing after going through NCLEX-RN sample questions? After taking going through sample questions it makes sense to watch other videos such as how to study smart essentials, shown on this page, and even consider enrolling into self-guided NCLEX-RN course offered by GraduateX, giving you flexibility to study in stress free environment, using clean and intuitive interface, focusing on the categories and topics that you are weakest in. Remember NCLEX-RN exam is adaptive. Note Rome Wells is no stranger to adaptive exams, and has reviewed in the past not only courses for nurses that offer adaptive based environment, but also had pleasure reviewing courses in other profession fields, and knows exactly what adaptive based exam is. In fact check out some adaptive courses in other professions that Rome Wells had pleasure reviewing such as course for accounting CPA exam professionals, or course for business graduates. Rome Wells is a good guy former certified math teacher for the state of CT and simply provides good advice to students and manages to relay his tutoring expertise to many students regardless of what profession they are in, helping students save money on education. He uses his engineering and mathematical background to find out the truth about education and feed that truth to you. Check out Rome Wells IT network engineering book for example. (off topic). Any way enough about Rome Wells, let’s focus more on you future registered nurse! NCLEX-RN adapts to your overall skill level, best way to understand what it means is to imagine your-self in gym, working out. FYI Rome Wells loves to work out, but not in gym but rather on the floor doing breakdancing in case if you are interested, check out Rome Wells on facebook (search for chosen few crew) and see some of his breakdancing videos, anyway I went off tangent here, so what was I saying? Well I was saying that yes adaptive test is like working out in gym, where you pull some weight and if your weight load and try to bring it up and down, up and down, then if it too much for you, you take another load which is much lighter, and bring it up and down, up and down, and keep working out until you reach the time limit and your overall capacity. Your overall capacity means how much load you can handle before calling quits. Similarly NCLEX-RN exam has similar type of style formatting and passing criteria for how much knowledge you should know before calling quits, except you are not the one calling quits, it’s the actual test engine that calls it quits once your reach passing criteria. Note GraduateX doesn't have adaptive based formatting couse structure, however have advantages of it's own. You can check out official gym video on official site about NCLEX adaptive exam, to see what I am talking about. However the point I am trying to make is, consider practicing well ahead of time before you take your exam and exercise your brain, so this way you can reach your passing score easier. Think of it as working out in gym, the more you work out the stronger you get. GraduateX NLCEX-RN course help you in such a way that it actually allows you to practice exercise in mobile friendly, clean layout and simple way, stress free settings. Note although the test format style for GraduateX is not adaptive as the actual, exam it doesn’t switch weight loads on you sort of like the real test does. It doesn’t have fancy dashboard like other test prep courses for NCLEX-RN have, it’s extremely simple and easy to follow. However GraduateX NCLEX-RN course does provide you the feeling of being stress FREE working through your questions without 2 many distracting elements as it is the case in many other courses, not being locked down into adaptive test based format, giving you flexibility to practice across variety of topics to strengthen your skill set. This is great for students who do not want to be locked down to a particular exam format and who want to have the freedom of improving their skill level based on particular nursing exam topics. Leveraging this course, as additional layer of your test prep journey, can greatly help you maximize your overall, learning effectiveness. Of course even greater way to increase your learning effectiveness is to get a tutor. In case if you are stuck in your exam or don’t’ understand something feel free to check out this site www.TutoringServices.com where some tutors only charge $15 (payable to Tutoring Services, LLC, meaning for first lesson tutor does not even get paid, tutors are willing to take that risk to prove to you how good they are and to be listed on our Tutoring Services site) for first lesson then if you like your tutor, for the rest of the lessons you can work directly without recurring agency fees! Wow that’s a lot of money savings! Some Tutoring Agencies rip nursing students off offering tutors with whooping 40 to 70% agency fees, it’s ok if it was 25 or 30% but dang up to 70% fees wow! No wonder why education is so expensive. Don’t be victim of such agencies, instead check out site Rome Wells created and see if you can find a tutor there get first lesson for $15 and saving a lot of money on your tutoring education expenses. Benefit of getting access to GraduateX course vs local tutor! In case if you are wondering how much local tutor costs, let’s just say the answer is a lot more in comparison to how much it would cost to pay for this GraduateX NCLEX-RN course and study on your own terms and your own schedule. For typical 10 tutoring sessions some students may end up paying anywhere from 1000 bucks to 2000, depending on the tutor and in some case even more, of course it all depends on geographical, region, supply and demand etc. Speaking of tutoring, how on earth does Rome Wells know so much about nursing profession if he is not a nurse? Knowing about this exam makes sense for us, for other educational companies it doesn’t make much sense, hence they don’t bother going into eccentric details about NCLEX-RN test preparation strategies and course description analysis and how you can save money, but we do, because it makes sense for us, simply because by helping you, we are not only helping our selves for our local tutoring business model, but also helping good companies out there who are creating this course possible, companies such as GraduateX and obviously helping you. In our case in CT NY and NJ specific counties our Nursing tutors are agency managed, therefore we charge small agency recurring fee, but provide higher quality match, and thereby increase chances of students doing better on their exam, and therefore our tutors cost more than completely independent tutors. However for students who do not care about any middle man fees and just want to find a tutor on their own and take higher risk (since tutors not managed by agency), then www.TutoringServices.com is the site for you. What Would Rome Wells do if he wanted to save money on Nursing education? If I was a nursing student here is what I would if I was on the budget. Definitely do not use any other tutoring sites (unless they provide value and don't charge insane recurring agency fees, that can be easily distinguished if you think the price of a tutor is too high), since majority of them are a rip off and charge you recurring agency fee from every hour. (unless of course agency provides high quality match making services and offer also a great price for tutors then it’s a different story, however there is not that many agencies out there that do that) and instead use www.TutoringServices.com site to get a tutor that I can try for first lesson for only $15, then if I like the tutor then end up working direct without recurring agency fees, helping me save money. I would study on my own with the help of lots of sample questions initially and after taking bunch of sample questions would consider either purchasing GraduateX course the course that helps me study in stress free settings and helps me reinforce skills further and do so as far ahead in advance of the test as possible. I would definitely study from some books in addition to that, in fact I have created this site www.UsedCollegBooks.NET, helping students buy books direct from each other in their own school or from the cheapest bookstores online. I created this site to help world stay green and helping students find affordable books without paying arm and a leg. What I just described is one possible Study Path for your NCLEX-RN test prep journey; note obviously students do need to follow such study path and can trim off for example tutoring, and instead only study with the course and book. Under no circumstances I would only study from the book, books are more boring, and static way of learning new material. Course on the other hand has videos, mobile friendly and great tool for on the go, especially if you are on the train or anywhere else and have access to WIFI or cellular. I provide many other reasons why studying only from the book may not be best for everyone. It’s helpful, but by no means the most effective. I describe difference between static book studying and actual course in my other article for GRE business students here. Rome Wells is all about helping nursing students save money! 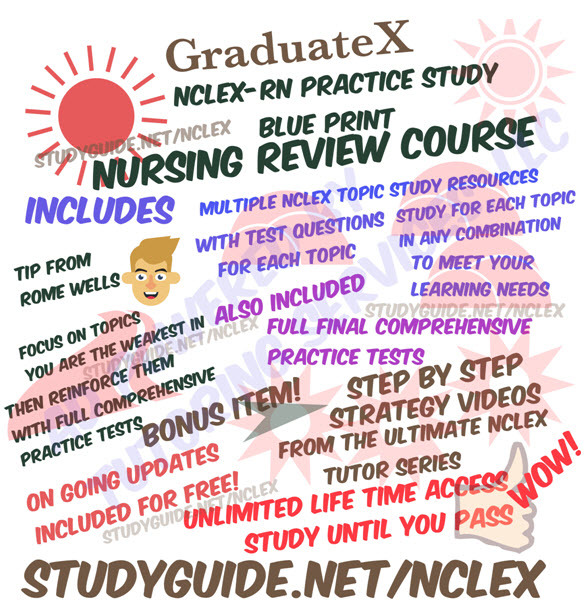 Additionally GraduateX compiles course questions for NCLEX-PN exam, as well and not just NCLEX-RN, which is great for practical and vocational nursing graduates. Note many edu companies out there cringe when they see any of Rome Wells mone saving advice, because it goes against all of their principles. Majority of the companies out there have one principal only and tha tis... make as much money off nursing students as possible! That is a bad principal. Rome Wells is a figher for nursing student rights and an educational advocate, providing academic advice and saving money tactics that simply takes business away from any of the competitors, resulting in many of such companies advertising other nursing test preparation products and promoting only their products, while Rome Wells doesn't care about any of that and promotes products and methods of study that makes the most sense to students, and not only that, but also provides opportunities for students who did take exam and did well on it also, helping students become tutors, and make some part time income tutoring nursing exam other students! You simply don't see that anywhere! Have a brother or a sister who is about to join military field? See how Rome Wells helps military students! Taking college placement test? In case if you are. See how Rome Wells helps new college students save money, by showing them how to skip classes and still get college credits! Anyway enough about Rome Wells, although i have probably said the before, here is some more visual info about GraduateX NCLEX RN course! Sweet! 2. It's extremely mobile friendly. 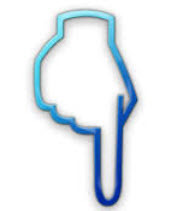 Use IPAD, or other mobile devices to navigate throught the course. You get a lot of NCLEX-RN test prep functionality and tools with this course and it's not too expensive. Are NCLEX RN books less expensive? Yes, however this is not a book, it provides a community user experience, for students who do not like to feel like they are studying on their own. 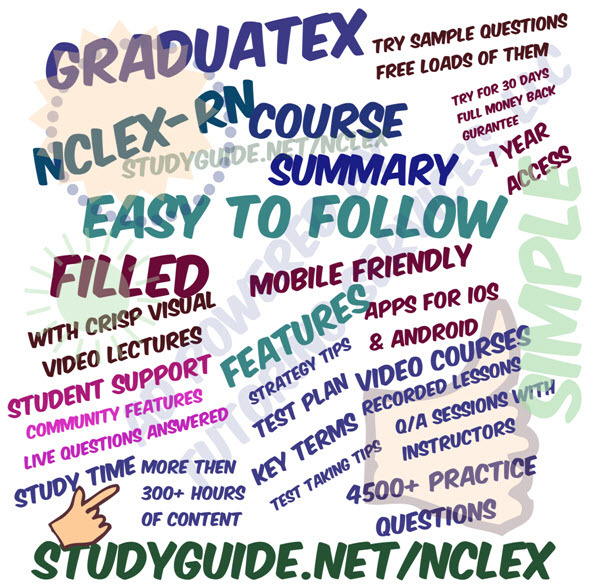 It provides replayable videos, that you can watch on your own free time and simply makes it easy for you to understand NCLEX-RN concepts. Rome Wells knows how to explain things more visually, more appealing to students and help them make their decision about this course, and whether they should consider purchasing it or not! This is a quick course summary. I know, there is a lot to read, some students simply don't like to read so i figured these images can help! Here is a bit more info about the course, note there is a lot of valuable items on this course, including some bonus items! One thing I like about GraduateX is that they let you try some sample questions see how you feel (and they got a lot of them! 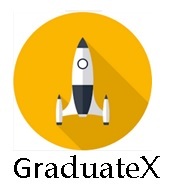 ), then if you like how you feel navigating through some sample questions you can get a full taste of the course by signing up for GraduateX course. Also it's kind of kewl that updates are free, often exam changes but many companeis don't change their content! Resulting in outdated questions! and if you want updated questions they charge you! However, GraduateX doesn't do that and includes free updates as part of the course. Plus it got some killer step by step strategy tutor videos. Still not sure about this NCLEX RN course? Try these FREE Sample Questions for your nursing certification!